Like most other parts of the human body, the brain needs exercise if it is to function at its best. As the old saying goes, “use it or lose it!” Most people have some idea about how to go about exercising their bodies but when asked about how to exercise your brain, they can be stumped. So, here are some great ideas to get that grey matter alert and functioning well. The great thing about exercising your brain is that it doesn’t require expensive gym memberships, getting all hot and sweaty or any special sports equipment. You can do brain exercises just about anywhere, at any time, on your own or in company. The most important thing is to make the decision to exercise your brain more and then follow through with a plan. So, what kind of things can give your brain a workout? Some of the first activities that come to mind are usually doing crossword puzzles or Sudoku, neither of which particularly appeal to me. I mean, I’m hopeless with numbers anyway and simply looking at a Sudoku puzzle just freaks me out. I do love words and language though, and have been known to enjoy the odd crossword puzzle in my time, but I find that the clues are often really obscure or the answers I come up with just don’t fit the spaces. But if you enjoy these activities, good for you; you’re already doing some excellent brain exercises. Remember having to learn your times tables off by heart in grade school? I’ll bet you don’t often recite them anymore! Well, think again; remembering your times tables and reciting them off in your mind is a very good way of giving your brain some much-needed exercise. In fact, I discovered quite by accident, that repeating my tables, starting from the two times table and working up, was an excellent way of improving my focus and concentration during stressful times at work. When I get stressed, coherent thought seems to go out the window but saying my tables to myself helps to get my brain back on track. Try it for yourself. Another form of exercise for your brain is positive affirmations. These are short sentences you say to yourself to help you reach a more positive and constructive mindset. Some years ago, I was called upon to do some public speaking. Like so many other people, I was terrified at the prospect and was sure that I would forget what I had to say. My favorite affirmation that really helped me get through this was (and still is) “I am a strong and courageous person. I can feel my fear slipping away as I grow in confidence every day.” The Louise Hay books are fabulous for finding affirmations that apply to you and your situation. Would you believe that meditation is also exercise for your brain? Learning how to settle and silence all that chatter running around you mind takes strength and practice. There are simple ways to meditate that can help you with mental clarity and stress reduction as well as giving your brain some exercise. Reading is a simple and relaxing activity that is also exercise for your brain and it doesn’t matter what you read; it can be the newspapers, fiction or non-fiction. When you read, your brain is working to understand and assimilate the content and store it away. Learning something new really gives the brain a good workout so read about a subject that interests you but you don’t know much about or take a short course on it. Learning a new skill or trying a new activity are good ways of working your brain as well as adding quality to your life. Creative activities like painting, sewing, cooking, craft and woodwork help to keep your brain active and give you a sense of personal satisfaction at the same time. Writing is another form of brain exercise, so try your hand at poetry, write your family history or keep a simple journal. There are numerous board games and activities on the market that are both fun and work your brain too. Learn to play cards or try your hand at card tricks; get involved in jigsaw puzzles or find some friends to play Scrabble or Monopoly with. Join a group or club that is organized around activities you enjoy or would like to learn and have the added advantage of meeting new people and making new friends. Get involved with your local community or volunteer your time with a charity. All these things provide exercise for your brain. Much research has been conducted in recent years about how exercising the brain can protect against dementia. Results are indicating that the more you exercise your brain and the more complex and challenging the activities are, the greater protection you may have. So pick a couple of these examples on how to exercise your brain and start working out today. That’s great. I have heard of that game but haven’t tried it. I love sudoku! And puzzles, word searches and crosswords. Scrabble is another good one! I definitely need to learn to meditate though. Puzzles are great. Yes meditation is good. I wish I could find more time to do it more. That’s great. My father in law loves sudoku. I haven’t mastered them yet. Right now they just frustrate me. My 85 year old grandpa makes crosswords and reads in English and he is really sharp compared to other people his age. Like going to the gym you have to keep your brain active or it will rust. I probably get plenty of brain exercise at work, designing parts for aircraft, launch vehicles, and spacecraft. I also read a lot. For positive affirmation, I have a t-shirt that says, “I am not scared. I am not afraid. I am an Animal and I will eat you if I have to.” I think of that before speaking in public. Cute shirt. Glad to hear your job gives you lots of mental stimulation. I love Sudoku. I used to play it all the time on my phone an at work. I haven’t done it in a while though, but I still have an app on my phone. 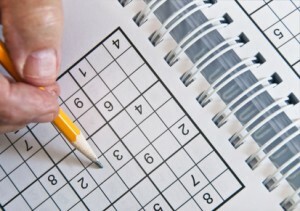 I actually enjoy the challenge of hard Sudoku as a way to relax haha, but most people probably wouldn’t see it that way. I would be like most people. They just frustrate me. In due time I may grow to love them. One that I have always thought was fun was using your opposite hand to do things… For me, I am very right-handed… so when I remember (which I usually don’t), I try to either write with my left hand or brush my teeth with my left hand, or some other common task. It breaks the routine of those things (which I think helps the brain), and is a definite exercise of the brain. In this case, they say that using the opposite hand is a big help for your creativity!